So I haven't blogged much lately For reasons that are somewhat lacking. I have been busy with school but I think the real reason is my lack of interest in actually writing anything lately. That's all my MBA class is, writing. I write forum postings and papers constantly. It's making me feel like writing is a very boring thing to do. Even though I have many things on my mind I just can't seem to want to site down and write about them. I will try however. 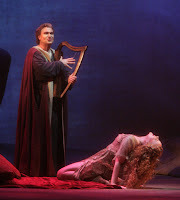 Two weeks ago on Tuesday January 29th, Flor and I got awesome tickets to see Richard Wagner's Tannhäuser at the San Diego Civic Theater; it was incredible! We were the beneficiaries of deeply discounted tickets due to a student initiative at UCSD. For $30 we got to sit on the orchestra level almost halfway up to the front. We had a great view and the music was beautiful. The opera was 3 hours plus one hour of intermission so it was long but we had a great time. We went with Lindsay and Cat and they relayed to us a message from Steven. When told we were all going to the Opera he said: "The Opera! That's so boring!" Well, I must say it was not boring Steven and we are going to do it again... next Tuesday. Bring on Mary, Queen of Scots!